Every day, Watch This offers staff recommendations inspired by the week’s new releases or premieres. This week: With the Academy Awards coming this Sunday, we’re highlighting work by master filmmakers who never won the Best Director Oscar. Nicholas Ray is the kind of director destined to be overlooked by the Academy Of Motion Picture Arts And Sciences, as he was idiosyncratic and given to working within unpretentious genres, imbedding their formulas with neurotic emotional meanings. Virtually any of Ray’s films could have been titled In A Lonely Place, as many of them concern the isolation of wounded people attempting to reconcile their interior damage with their exterior life with mixed results. Regardless of Ray’s Oscar misfortune, many of his films have come to be celebrated, most famously Rebel Without A Cause, along with Bigger Than Life and Johnny Guitar, among others. But Ray’s 1951 film, On Dangerous Ground, remains relatively unknown and is due for rediscovery. 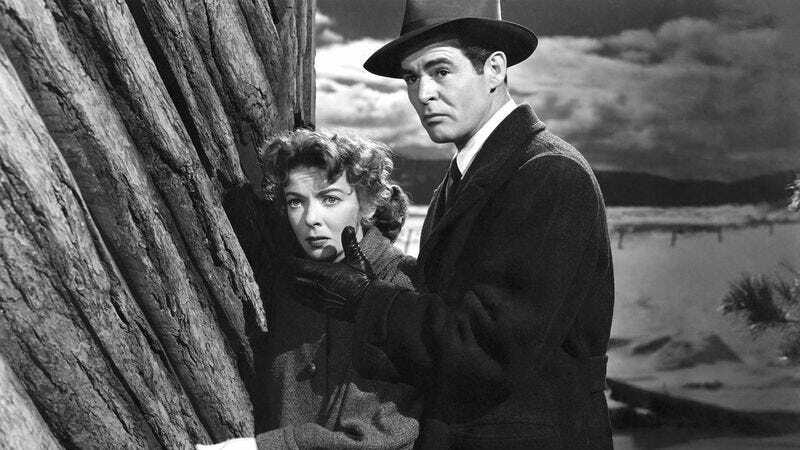 The film’s protagonist is Jim Wilson (Robert Ryan), a police detective given to beating information out of suspects in implicatively sexual torture scenes. Ray sketches this rogue enforcer’s life in quick, heartbreaking strokes. The opening montage contrasts Jim with his partners as each leave their respective houses for work, the latter interacting with their families while the former hastily finishes a meal in his depressingly spare one-room apartment, plopping the dishes in the sink. Soon, Jim’s chasing criminals within a city that’s established, via Ray and cinematographer George E. Diskant’s prismatic imagery, as a physical manifestation of Jim’s bitterness and estrangement. Attempting to brush Jim’s abuses of power under the carpet, his superiors eventually send him upstate to a vast snowy wilderness that stands in pointed spatial contrast to the urban jungle Jim knows, though its inhabitants are equally miserable. Especially Mary Malden (Ida Lupino, another director unjustly ignored by Oscar), a blind woman involved in a murder case that Jim’s investigating. As Jim and Mary’s relationship blossoms, though, the openness of this rural landscape comes to signify a shucking of interpersonal baggage. It sounds sentimental, but Ray and his actors evade that trap with elegant subtlety. Ray’s images are often unnervingly obsessive, most notably a close-up of Jim and Mary’s hands, intertwined, that’s worthy of silent cinema. Ryan, a wonderful and reliably underrated actor, pars Jim’s misery down to a series of succinct gestures, most memorably facial movements that fleetingly convey sadness within stoic hostility. Lupino has the more difficult task, though, as she must inform an especially thankless stock role—the redemptive blind woman—with tough pathos. Lupino occasionally opens her eyes with nearly surreal wideness, communicating a kind of qualified vulnerability, physically encapsulating Ray’s cinema in a nutshell. Availability: On Dangerous Ground is available on DVD from Netflix, Amazon, or possibly your local video store/library. It can also be rented or purchased through the major digital services.